Adding John Scott may have added a needed goal scorer to the Sharks, but their possession numbers are falling fast. Another week, another week of possession data in the NHL. Thankfully, while last week several teams had only played 3 games, this week the minimum # of games played is 6, so our minimum sample size for our Bayes-Adjusted Fenwick Close #s (BAFC) is now 6 games of data. And with more data, we’re starting to see the numbers for this year have a greater impact on the possession rankings so far. There were 2 interesting objections to the numbers after I presented them last week. The first was one I mentioned in the piece – technically it would’ve been better to weight by shots, not games. I actually took a look at how that would go this week and the changes are so minor as to be irrelevant. As such, I’m sticking with weighting by games to have a more consistent week to week approach , since that’s what I started with. The second, by Steve Burtch, is that it’s technically not Bayesian to weight the older season the way I am, with the older season’s weight fading to 0 at a certain point – a better bayesian approach would simply have the new signal (the 14-15 data) get stronger and stronger, so that while the prior (the 13-14 data) never disappears entirely, it is eventually overwhelmed and of minor impact. This is indeed true, but I’m sticking with the current system as I suspect after 25 games most of us are going to completely ignore the past season’s results anyway plus it’s the same method practically as the other ranking systems for college sports that I used as inspiration for this project. None of this is to say these objections don’t have merit, and if others are interested, seriously, go right ahead and create your own numbers by your own methods: this is clearly arbitrary to an extent, so there isn’t a wrong answer as long as your process is sound. 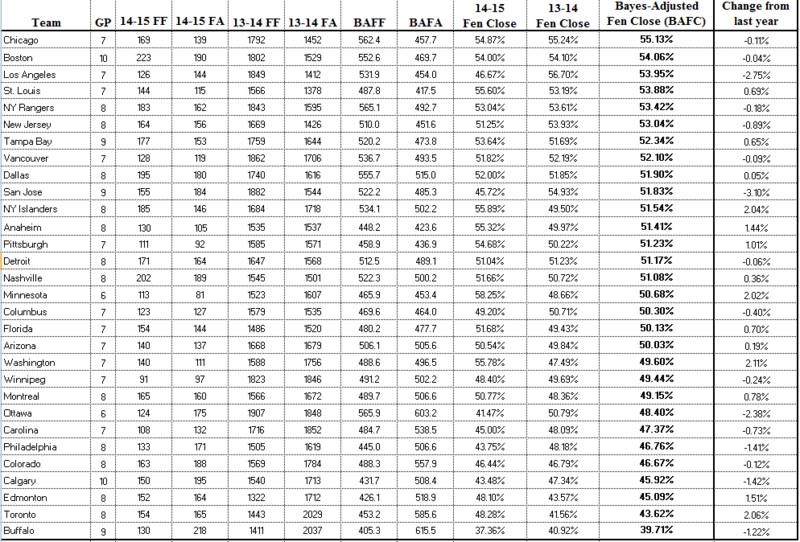 With that ado, below are the Bayes-Adjusted Fenwick Close #s through 10/25/14. I’ve added another column this week, which shows the change each team’s #s show from last year. With still a small amount of data from this year, the differences are mainly small, but not always. For example, the Sharks continue to collapse and are now over 3 percentage points worse in possession than last year – that’s still a good team, but that’s not really a contender anymore. By contrast both the Islanders and Ducks are clearly rising. Love the work. Hard to find good info like this, especially with a few sites closing up shop. Appreciate the the time that goes into this.